Habit: Annual to perennial herb, generally from taproot, occasionally rhizomed. Leaf: basal or cauline, alternate, generally pinnately toothed to lobed, generally sessile. Inflorescence: spike, raceme-like, or flowers in axils of distal, reduced leaves. Flower: radial or (sect. Gaura) bilateral, generally opening at dusk; sepals 4, reflexed in flower (sometimes 2--3 remaining adherent); petals 4, yellow, white, rose, or +- purple, generally fading +- orange to +- purple, tip notched or toothed; stamens 8, filaments sometimes (sect. Gaura) with paired teeth at base, anthers attached at middle; ovary chambers 4, stigma generally deeply lobed, generally > anthers and cross-pollinated (or +- = anthers and self-pollinated). Fruit: generally dehiscent, cylindric to ovoid or obovoid, cylindric to 4-winged or -angled, straight to curved, generally sessile (base sometimes seedless, stalk-like). Seed: in generally 2(1--3) rows per chamber, or clustered or reduced to 1--4 per fruit. Unabridged Note: Many species self-pollinated; some of these have chromosome peculiarities (ring of 14 in meiosis) and +- 50% pollen fertility; they yield genetically identical offspring. Habit: Biennial, densely minutely strigose and (especially in inflorescence) glandular; hairs also long, appressed to spreading, sometimes with red, blister-like base. Stem: erect. Leaf: cauline 4--25 cm, oblanceolate to lanceolate or elliptic, generally dentate to +- entire. Inflorescence: spike. Flower: hypanthium 20--48(55) mm; sepals 27--48 mm; petals 25--52 mm, yellow fading red-orange. Fruit: 20--65 mm, 4--7 mm wide, narrowly lanceolate, +- straight. Seed: 1--1.8 mm, angled, irregularly pitted. Chromosomes: 2n=14. Note: Generally cross-pollinated. 3 subspecies, 2 in California. Oenothera elata subsp. hirsutissima (S. Watson) W. Dietr. Stem: 10--25 dm. Flower: sepals green or red-flushed, hairs glandular or not, also spreading, red, blister-like base +- 0, free tips in bud 3--6 mm; anthers 8--15 mm. Ecology: Moist places, generally inland; Elevation: < 2800 m. Bioregional Distribution: CA; Distribution Outside California: western United States, northwestern Mexico. Flowering Time: Jun--Sep Note: Several intergrading forms. 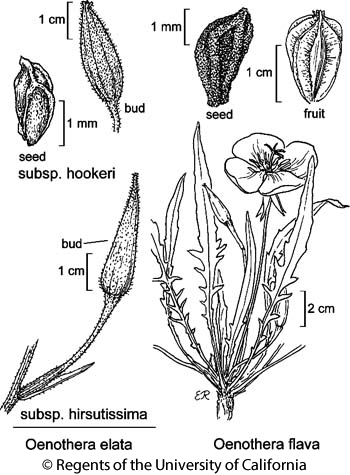 Citation for this treatment: Warren L. Wagner 2017, Oenothera elata subsp. hirsutissima, in Jepson Flora Project (eds.) Jepson eFlora, Revision 5, http://ucjeps.berkeley.edu/eflora/eflora_display.php?tid=51751, accessed on April 24, 2019.